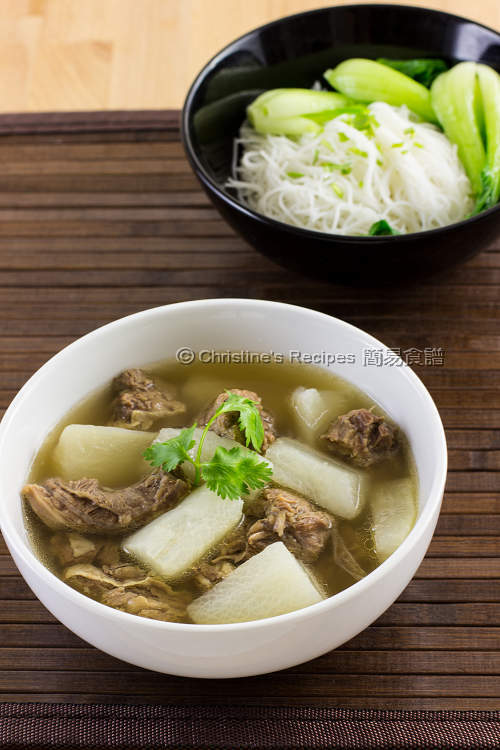 This beef brisket in clear broth dish goes perfectly with vermicelli or egg noodles. Just add a few bunches of Chinese bok choy and cook in the soup. Then you and your family can enjoy a tasty light meal. I had luck to spot this lean beef brisket from a nearby Asian butcher. Why not got some back home and cooked up for hubby as he’s a big fan of beef brisket? Every time I cooked beef brisket, I’d make the traditional flavoursome stewed beef brisket in Chu Hou sauce, a fool proofed dish for anyone who wants to try Hong Kong cuisine. This time I tried another classic beef brisket soup dish that I grew up with and it’s still popular in Hong Kong. The cooking method for both mentioned dishes is similar. As for making this beef brisket soup dish, the key to success is preparing a delicious clear soup base, not a cloudy one. For convenience, you can get quality store-bought chicken stock. This soup dish goes perfectly with vermicelli or egg noodles. Just add a few bunches of Chinese bok choy and cook in the soup. Then you and your family can enjoy a tasty light meal. Blanch the beef brisket in boiling water to remove the blood. Drain well. Cut into chunks. Trim away the fat if needed. Set aside. Heat oil in a wok or large pot over high heat. Saute ginger and garlic until aromatic. Add the beef brisket. Sprinkle wine and stir to combine. Pour in stock and water. Add star anise, bay leaves, white peppercorns and rock sugar. Cover and bring it to boil. Cook for about 30 minutes. Turn off the heat. Don’t remove the lid. Let the beef cook with the residue heat inside the pot for about 15 minutes. Repeat this step until the beef starts to turn soft. Use another wok or frying pan. Heat oil and sauté the radish. Transfer and cook with the beef until the radish is softened and beef brisket is tender over medium-low heat. Replenish some boiling water if necessary. Season with salt. Serve hot. By adding a bit of rock sugar, not only it makes the beef brisket taste pleasant, but also it helps the meat turn soft more quickly. Chicken stock works perfectly as a clear soup base. You might use beef stock anyway. Oh this steaming bowl of beef brisket is just perfect for the cool weather. I think I can smell the the fragrance of radish too. Beef and radish go so well together, don't you think? Thank you Christine for sharing. Love beef briskets prepared at any way! This looks so light yet so flavourful, Christine. I might be missing something, but what about the anise and white peppercorn? Add them after pouring the stock. I updated the recipe. Thanks, Christine. After step 3, bringing the ingredients to a boil, I'm assuming we need to also bring the heat down and allow the pot to boil at low heat? I left the pot on high heat and everything burned within 20 minutes :( I take things quite literally so I made that mistake! Oh no, sorry for your burned beef brisket experience. 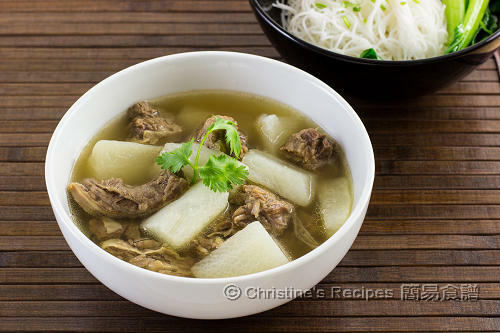 Reduce heat to medium at least to cook the radish with beef brisket until everything is tender. Or you may add more boiling water if necessary. No problem. Sorry that my first several comments on your blog are all pointing out missing information. You should know that I love your recipes! I'm relatively new but my wife and I have really enjoyed some home cooked asian food. Better than what I can find in Boston, so thanks for your hard work and generosity! Kindly note that every kitchen and stove power is very different. The cooking time suggested in all recipes, not just mine, is only a reference. Many variables are to be taken into account. It also depends on how much liquid was left in previous step. So don't leave your dish unattended especially if you make it the first time. Thanks for your feedback anyway. Do you think this can be cooked in a crockpot and still yield a similar result? A crockpot will do an excellent job for making this dish. The result will be fantastic. So glad that you liked my recipes. Thanks for your kind words. What is the other name of beef brisket? I try to look for beef brisket in australian supermarket (coles, woolworth), but i can not find any of it. Can i substitute the beef brisket with gravy beef? Or do you have a suggestion what kind of meat that can be used in order to get the same taste with your recipe? Coles and Woolworths seldom have stock right now. They sold this kind of cut before. You may try to get it from local butchers or those run by Asian. Which city do you live in? Beef brisket is also called beef fingers (beef rib fingers) in Australia. Gravy beef is also a kind of budget cut that is suitable for making stew. But I find it's not as tasty as beef brisket if making this dish. It's my first time at your blog and I'm grateful for this as I miss Hong Kong beef soup. Does it matter if I don't use radish?? You can skip the radish. No problem. Can I use a pressure cooker ? Sure, your pressure cooker can help a lot and shorten the cooking time. Please check with your user's manual for the cooking time. No problem at all. You can skip them for your kids. Although listed as an autumn dish. I made this tonight and coincidently it's the first day of winter, it was perfect. Thank you for sharing. My family absolutely enjoyed it. Hi Christine, do you think the soup will taste as good if I were to use oxtail instead of beef brisket? Oxtail is good for making soup. 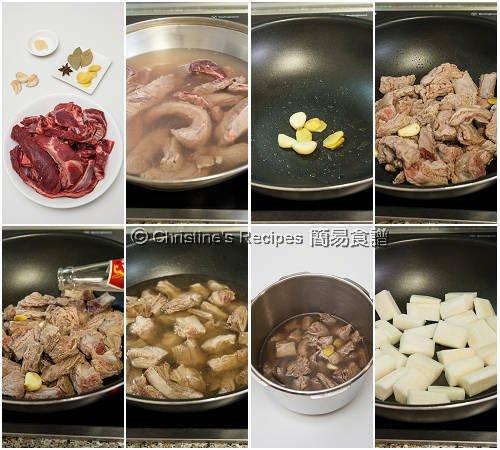 If using oxtail, the soup might not be very clear, but the taste will be fantastic.